Was it Karin’s or was it Reta’s? What it is, is really good. Triggers – I am surrounded by them. The simplest motion, activity, word, smell, sound – any one of these things can put me in turmoil. Even an activity like changing the bed sheets can be cause for upset. Fresh bed sheets are always lovely and my longstanding habit is to change the sheets every week. I have three sets of bedding – two of which I can’t use any more because of associations. One of the sheet sets was used to make up the hospital bed when it arrived. They were on the bed that Kevin died in. I will never throw them out, but I will never use them again either. Another set was one we picked out together. A few years ago, Kevin had gotten a bit obsessive about how sheets felt against his skin. He didn’t like microfiber, nor flannel, not 400 thread count or 800 thread count – they all felt awful. We ended up trying, loving and buying bamboo sheets. I have a lovely set of bamboo sheets but now I have to brace myself just to put them on the bed. It may be time to retire them. Needless to state, for my own peace of mind, I have ordered another set. The other day I made spaghetti sauce; this was one of Kevin’s favourites. The house smelled divine, warm and welcoming. It was, at the same time quite sad, one of those times where I smile while I cry, the smell triggering a sense of profound loss. When Kevin liked a dish he would record it in his own little cookbook aptly titled – The Cookbook for the Single or Married Batchelor. He’d add little graphics and omit some key details, but the cookbook is so him. 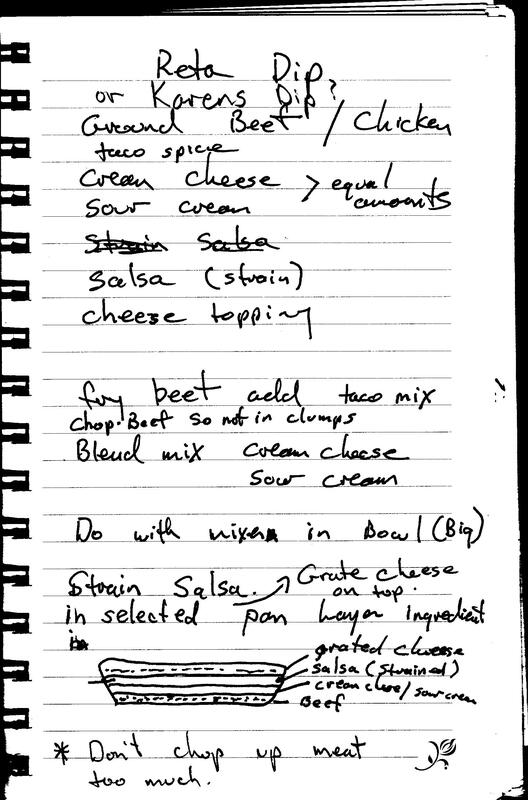 The page at the top is one of his entries in it, one of the most controversial – he was never quite sure who he got the recipe from; he just knew he liked it. This book is one of the most precious things I have. Reading it brings out the usual response – I smile while I cry. I call this cryling – tears that come from love and loss and reflect wistful dreams of times past. I have resigned myself to this outcome, cryling, with respect to many of my day-to-day activities. Especially lately, there is a degree of strain and a heightened awareness that has crept into my world as we near the end of June. It was June 27th when Kevin was told he had cancer, the day our world was broken. This was a lovely post to wake up to on a very grey morning. I cried when you talked about the priceless little cookbook. How we all laughed and laughed over that little cookbook, but how wonderful to now have this little invaluable treasure. It is these little constant unusual momento’s that make me really wonder. Who in the family will ever be able to provide us with such insight to our world, Kevin had a unique thought about anything. Jenny, I hope I am not upsetting you with my comments, if I am please let me know and I will stop responding.